Adventure is in abundance in the land where the continent’s largest swamp meets the America’s Third Coast and host Tom Gregory wants to experience it all while he’s in St. Mary Parish. Exploring the Atchafalaya Basin, Tom takes a swamp tour with renowned nature and wildlife photographer C.C. 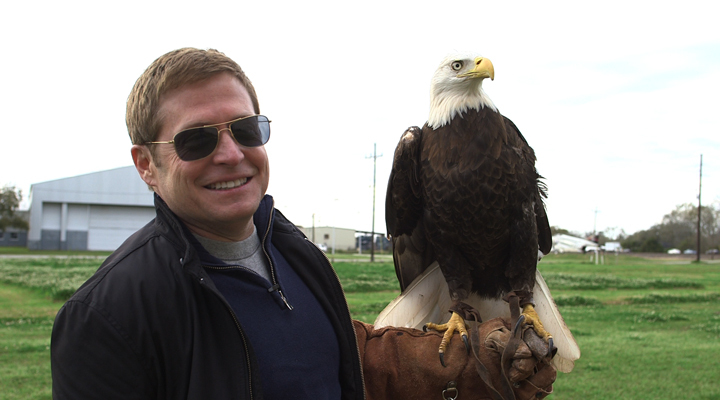 Lockwood and comes face-to-face with the symbol of America at the Eagle Expo. He goes out to harvest wild crawfish with Swamp Pop legend Don Rich and comes back with more than just lunch-- Don then invites Tom to Gros’ Marina for a weekend swamp party that is pure Cajun. Also in this episode, Tom visits the Sovereign Nation of the Chitimacha and discovers not only the tribe’s ancient tradition of basket weaving, but the place where all the locals go. That “place” may never be the same. During his journey through St. Mary, Tom also learns about how Morgan City became the African jungle in the first Tarzan movie ever filmed back in 1917. Annual festivals like “Rhythms on The River” and “The Louisiana Shrimp & Petroleum Festival” are featured, as is the Wedell-Williams Memorial Aviation & Cypress Sawmill Museum, and The Rig Museum-“Mr. Charlie”. The episode is a perfect travel guide for your own adventure along the Cajun Coast. Airing on WLAE-TV Fridays at 9:30PM and Sundays at 8:30PM. Recently, Go Coast: Louisiana won two awards presented by the Press Club of New Orleans for Excellence in Journalism; for best Public Affairs Program and TV Feature. The program’s host, Tom Gregory, won an Emmy in the Best On-Camera Talent category for Performer/Narrator from the Suncoast Chapter of the National Academy of Television Arts and Sciences. Go Coast: Louisiana also received a nomination for the Best Magazine Program.